Michael Crichton's introduction to Conan Doyle's tale, from his official web site. An interesting, if unexcited, review of Conan Doyle's literary techniques. To the indifference of the general public but the outrage of literary and silent movie fans around the world, the sequel to the blockbuster film Jurassic Park opened on May 23, 1997, utilizing the title of Sir Arthur Conan Doyle's seminal dinosaur story, The Lost World. 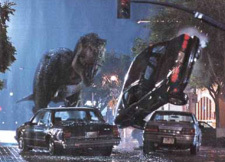 The fuss over the matter didn't negatively impact the film's receipts, though it never did perform as well as Jurassic Park, which at the time was one of the most - if not the most - profitable film of all time. I have to admit, from the outset, that I quite enjoyed The Lost World: Jurassic Park as a movie unto itself. But I've generally tended to enjoy sequels more than the first installments because they more deeply explore the settings established in the first. Many sequels miss the mark, but there are more than a handful that are are equal to surpassing the original. Besides more elaborate action and plot, The Lost World: Jurassic Park also asks far more provocative questions, like whether or not a cloned extinct creature possesses or deserves the same animal rights as a natural, extant creature. I was, however, unimpressed by the use of title that had previously belonged to Conan Doyle. That sideways glance became narrower the more the movie seemed to be cribbing material from the novel and the 1925 film adaptation of it. By the end, these similarities were practically screaming for attention: in echo of King Kong, which echos The Lost World, the prehistoric terror is brought back to civilization to terrorize an unsuspecting public. Had Michael Crichton, Steven Spielberg and scriptwriter David Koepp not used the title "The Lost World", these similarities could have been ascribed to the basic trope of the lost world tale. Doing so, they bring upon themselves the question of whether this is innocently a modern expression of the lost world genre, an homage to Conan Doyle, or literary and cinematic theft. It's a reference to Conan Doyle, one of his more pulpy stories. It's a Professor Challenger story, and it's actually not a very good book, but it's a wonderful title, and it's about an expedition to a place where there are dinosaurs. His disregard for the acknowledged literary classic from which he thieved a title and character names is flabbergasting... Especially considering how positively dreadful his novel entitled The Lost World is. The Lost World: Jurassic Park was one of those films that greatly benefitted from not being like the book it was supposedly based on. The title of Jurassic Park's sequel was, most-likely, a matter of utter indifference to David Koepp... as indifferent as his view of dinosaurs themselves. In an official online chat with Koepp held by Universal Studios shortly after the film's release, I was given the opportunity to ask about the decreased scientific accuracy of the dinosaurs. Koepp brusquely dismissed the question by stating that "scientific accuracy is boring". Following the chat session (which I admit to being somewhat taken aback by), I had the chance to speak to one of the moderators who approved the questions that would be forwarded to Koepp. The question about scientific accuracy was not the only, or the most personally important one, that I had wanted to ask. The moderator admitted what I had suspected: several people including myself had asked about the similiarity between the Jurassic Park sequel and The Lost World, but it was decided ahead of time that such questions wouldn't be allowed. Apparently Universal Studios knew of the similarities and didn't wish to dwell upon them. "When I first heard that Michael was going to write the book and that he was thinking of calling it The Lost World, I was thrilled because I'm a big fan of Sir Arthur Conan Doyle's book The Lost World. I was compelled by the idea of being inside a prehistoric world that exists today - not behind electrified fences, not in a theme park, but in a world without the intervention of man." The film itself is peppered with homages to the films that have gone before... The climactic T-rex sequence that borrows from The Lost World includes references to King Kong and Godzilla, for example. The notion of a lost world, a window on earth's distant past, inspires the imagination. The occasional real-life discovery of a prehistoric link - such as the ancient coelacanth: the 400 million-year-old fish found still to be alive or prehistoric insects found perfectly preserved in amber - fuels these dreams. Sir Arthur Conan Doyle visited the subject in his turn of the century Professor Challenger series. Somewhere beyond Doyle's vision of an evolutionary anomaly and John Hammond's technologically marvelous Jurassic theme park is The Lost World. Apparently, The Lost World: Jurassic Park is indescribably "beyond" the first Jurassic Park film and Conan Doyle's The Lost World. In the end, this may be much ado about nothing. For the immediate short term, it appeared as though The Lost World: Jurassic Park might forever eclipse its namesake. In describing Conan Doyle's tale for a group of fellow chatters on the afforementioned Universal Studios chat, one young and ignorant participant chimed in saracastically "wow, where are the fences? That's really original." As a matter of fact, it is. Furthermore, with ironic thanks to countless productions of The Lost World in the post-Jurassic Park dinosaur fever, the title has essentially been reclaimed by Conan Doyle. It is "Jurassic Park 2" that has become the historical curiousity. Review by Cory Gross. Official website of The Lost World: Jurassic Park.